Monday July 8 1907 I did ironing, baked bread cake and cookies before noon. I put the clothes away, dressed a chicken, put the house in order and got the supper work done. I had expected to go down to the store on a late car and go with Rob to meet [Vera?] and Jane who came on a late train from the east. There was a terrible storm and I could not do it. 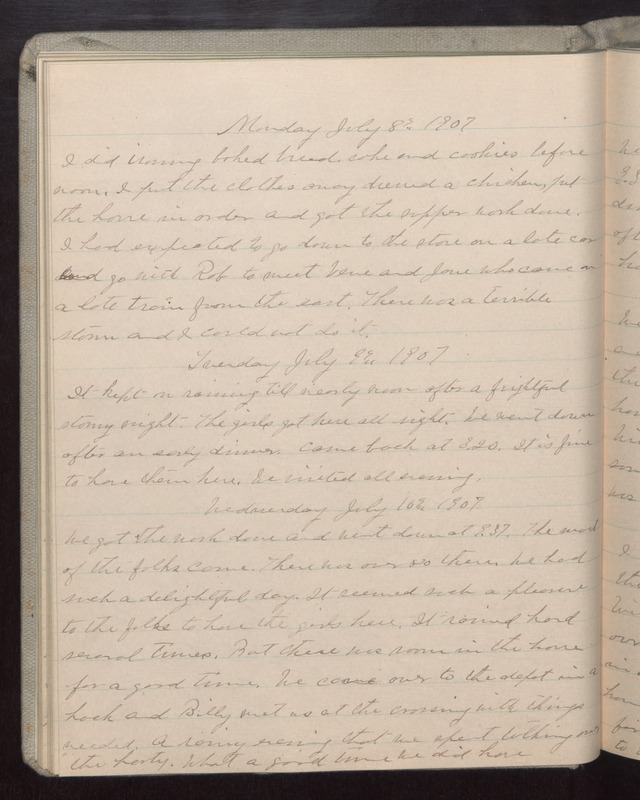 Tuesday July 9 1907 It kept on raining till nearly noon after a frightful stormy night. The girls got here all right. We went down after an early dinner. Came back at 3.20. It is fine to have them here. We visited all evening. Wednesday July 10 1907 We got the work done and went down at 9.27. The most of the folks came. There was over 80 there. We had such a delightful day. It seemed such a pleasure to the folks to have the girls here. It rained hard several times. But there was room in the house for a good time. We came over to the depot in a hack and Billy met us at the crossing with things needed. A rainy evening that we spent talking over the party. What a good time we did have.